The WebsterLEADS fall 2018 cohort showcase is Wednesday, Dec. 12, from 2-3:20 p.m. in the West Lobby of Sverdrup. Stop in to see students present their Phase 1 Leadership Models. You are invited to attend a viewing of posters presented by the WebsterLEADS Spring 2018 cohort. Students will present original leadership models of personally compelling leaders. This is the final project for the foundational course of the WebsterLEADS program: The Challenge of Leading. Presentations will be Wednesday, May 2 from 2-3:20 p.m. in University Center Sunnen Lounge. 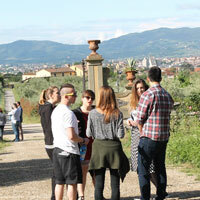 What could be better than learning about leadership under the Tuscan sun? 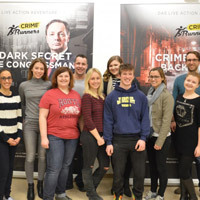 Twenty-one students from Webster's Vienna and Geneva campuses experienced exactly this during their annual leadership retreat. Through the Webster LEADS program, the students had the opportunity to journey to Italy for a weekend of workshops and activities at a small Tuscan town of Pistoia near Florence, Italy. 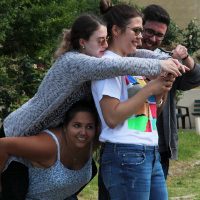 The LEADS Retreat program included different activities aimed at preparing the students to assume leadership positions at their universities, especially as leaders in upcoming new student orientations. While the Webster Groves campus undergoes improvements and expansions, a longtime leadership program experienced new construction well. Spring 2017 ushered in a new setup for WebsterLEADS, bringing together 19 students as the program's first cohort to complete the leadership requirements. 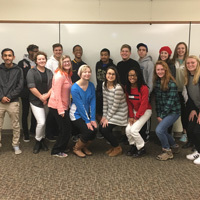 Each semester a new group of 20-25 students will start their WebsterLEADS process together and work collaboratively to foster growth in their leadership talents. 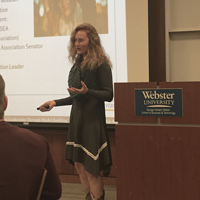 Continuing what has become a hallowed tradition, 30 students in the Webster LEADS leadership program from the Geneva, Leiden and Vienna campuses met for a join leadership retreat. This year they experienced a new location, a 16th century villa perched amongst the Tuscan hills just outside of Pistoia, near Florence, the home region of Geneva professor and head of Photography Department Francesco Arese Visconti. The weekend included icebreakers, team-building and skills-building activities as these students got to better know each other -- and their selves. Students in the Webster LEADS leadership program from the Vienna and Geneva campuses met for a joint retreat in the Swiss Alps.